I'm excited to announce that the December Virtual Book Club for Kids featured author is Jan Brett. If you haven't participated before, you can join in any month. Each month a group of bloggers picks an author to feature. We share ideas to use with the author's books and we host a linky party in case you have an idea you'd like to share. 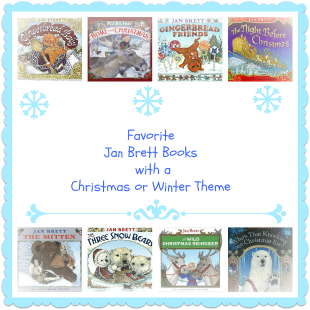 December is the perfect month to study Jan Brett books as she has so many Christmas and Winter themed books. Of course, she has books for every season and you can find a complete list on Brett's website. There are also over 5,000 free coloring, video, and activity sheets. This could be a great jumpstart in finding a project for the Virtual Book Club! 1. Comment below and let me know you'll be joining us for the book club this month. 2. Choose a book by Jan Brett and read it to your class or children at home. 4. Come back and link it up on December 17th. The linky will be live for 3 weeks so feel free to add more than one project or link up later. Here are some of the blogs that will be sharing book activities for Jan Brett books this month. I hope you join us on December 17th. Oooh add me to the list...I would love to do this too! I have "The Mitten". And I just borrowed "The Hat" from the library, to do projects with and I'm on the look out for about 4 more books/projects to do for the month. I've been wanting to participate in this for a couple of months now, so I think I'm finally ready to commit! Add me to the list...my ideas will probably not be super original since I usually get all my ideas from other bloggers, but we love Jan Brett, so I think it will be a lot of fun!